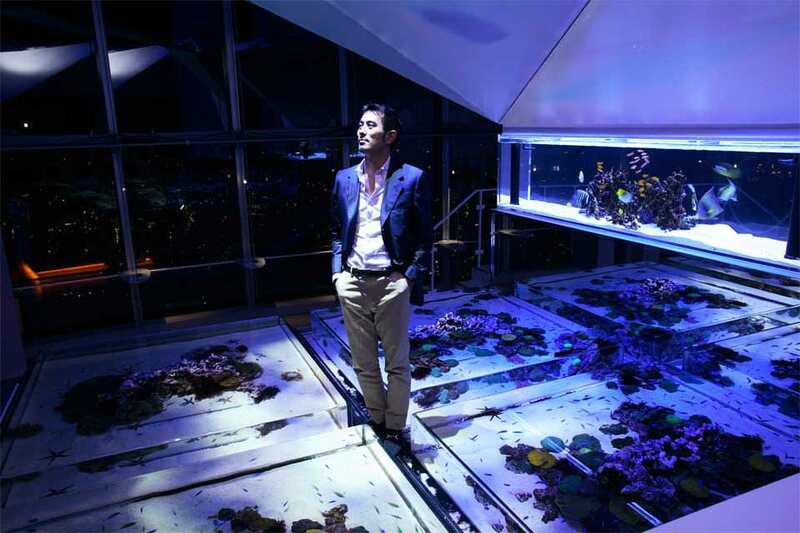 He is the first and only person to combine “art”, “design”, and “Entertainment” with his life work “aquarium”. Combining his rich experience with ornamental fish and knowledge of aquarium technology, he creates the world only “ART AQUARIUM” as the first ART AQUARIUM artist. Also, he is the only one who can hold aquarium exhibition as art exhibition in museums as admission charged events. He supervises and designs interior, lighting, projection, music, and space designs as well. At the present, he is working on developing traditional Japanese industry to modern art such as “Edo-Sakura Renaissance” and through that experience, he is developing the way to display the “ART AQUARIUM” as “real Japan”. Kimura is working toward showing his “ART AQUARIUM” around the world. “SKY AQUARIUM” hold regularly in the summer at Roppongi Hills and “ART AQUARIUM Exhibition ~Kingyo series~” which specializes in showing kingyo (goldfish) are especially famous and popular and has collected total of 9.45 million paid visitors until today (As of February 18th, 2019). He is also active in ocean conservation activities. In parallel to the extremely successful ART AQUARIUM, he distributed aqua-cultured clownfish “ORA” of Harbor Branch Oceanographic Institute (U.S.A. Florida) in Japan. Also he has been active in ocean conservation activities called “One Ocean Project” with many people who are involved in water activities such as ocean athletes. Moreover, he is active at “Sailors for the Sea”, established by Mr. David Rockefeller Jr., as one of the board member. In 2012, he was appointed as a designer of top world class glass art brand “VENINI” from Venezia Italy at exceptional young age and presented the artwork “Kingyo”, debuting as world-class artist. At the same time as his activities as an artist, his activities as a car enthusiast have also been remarkable, and there he has built naturally a broad link to the car world. He has made a success of world class vintage car competitions events; starting with the 2009 “Tokyo concours d’Elegance” competition, succesively serving as general producer for “Japan Classic Automobile” and others, and he held the “Concours d’Elegance Kyoto” competition at the world heritage site Former Imperial Villa Nijo Castle. As a young enthusiast who can direct proceedings on the ground, he is expected to play a role in handing down car culture to the next generation. Copyright (C) 2005-2019 H.I.D INTERAQTICA All Rights Reserved.